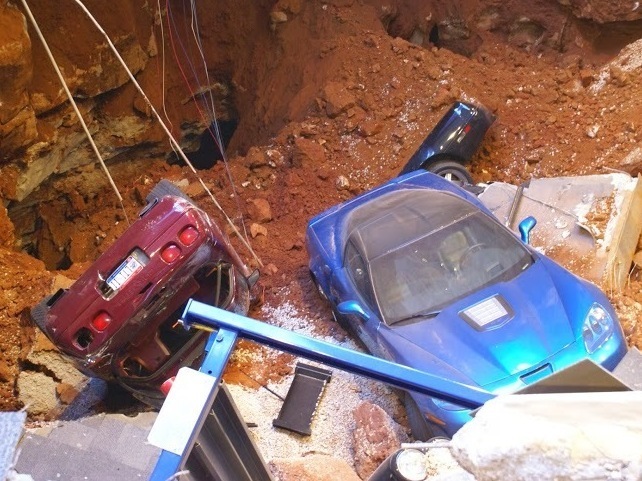 Corvette-Eating Sinkhole Will Be Filled In, Museum Says : The Two-Way When a gaping hole opened up under a clutch of classic cars at the National Corvette Museum in Kentucky, the disaster became a favorite exhibit. But the museum's board has decided to fix it, anyway. A glimpse of what it's like in the sinkhole that opened up Wednesday under a wing of the National Corvette Museum in Bowling Green, Ky. The sinkhole that swallowed up eight cars at the National Corvette Museum in Bowling Green, Kent., in February quickly became a favorite exhibit for museum visitors, but that's not enough to head off a decision to fill in the 60-foot wide, 40-foot-deep orifice in the floor. "The board had voted in June to attempt to keep part of the hole open, but the cost of retaining walls and other construction would exceed $1 million, officials at the museum in Bowling Green, Kentucky, said in a statement. "'We really wanted to preserve a portion of the hole so that guests for years to come could see a little bit of what it was like,' museum executive director Wendell Strode said in the statement. 'But after receiving more detailed pricing, the cost outweighs the benefit.'" As we reported after the Feb. 12 incident, which was witnessed by security cameras, the floor suddenly opened up and consumed six Corvettes owned by the museum, ranging in vintage from 1962 to 2009 and including two GM ZR-1s on loan from General Motors.